At today’s Chamber Board of Directors meeting, Jeff Jewell received the Chair of the Board Award in the field of economic development. This award is designed to honor individuals who have made a significant contribution to the community in a specific field of endeavor, and no more than six recipients may be named in a calendar year. 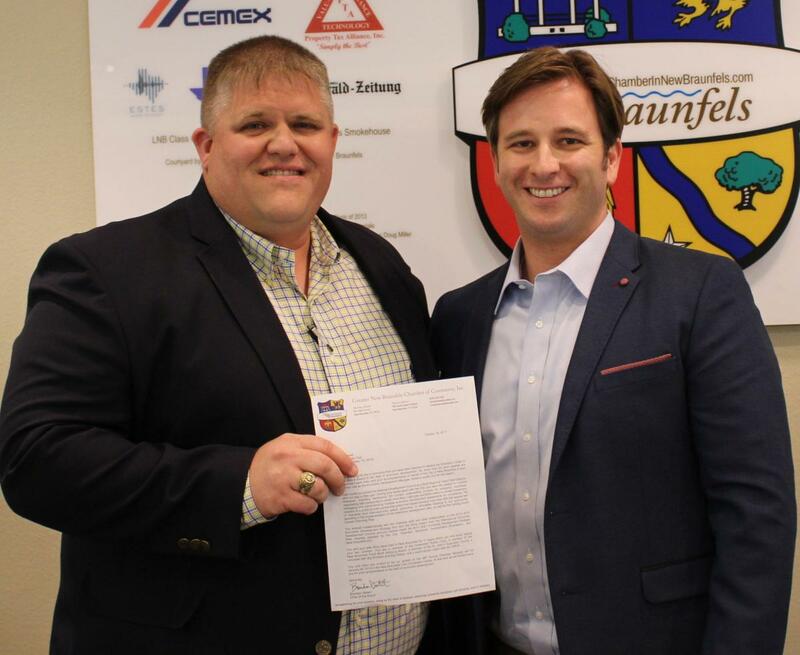 After seven years with the City of New Braunfels, Jewell joined the National Development Council as a West Regional Team Field Director last month. During his time with the City, Jewell was the catalyst for several initiatives, including developing the current underwriting process for analyzing incentives, negotiating with companies to create more than 1,000 jobs and $200 million in private investment, managing and administering multiple economic development agreements for compliance, the creation of a public-private partnership policy that helped develop more than 600,000 square feet of industrial and manufacturing space, promotion of affordable housing in our community, assisting in the implementation of the downtown development plan, as well as the coming South Castell Visioning Plan. Jewell worked collaboratively with the Chamber staff and other stakeholders on the 2012–2016 Economic Development Strategy that won the Silver Award from the International Economic Development Council, and he helped create the 2017–2021 Economic Development Strategic Plan recently adopted by the City, Chamber, Economic Development Foundation, and New Braunfels IDC. Jewell and his wife Alice have lived in New Braunfels for 11 years where they now enjoy raising their two children. He is a member of the Downtown Rotary Club, a member of the New Braunfels Food Bank Advisory Board, a member of the St. John’s Episcopal Church, a volunteer with Big Brothers and Big Sisters, a youth soccer coach with the YMCA, a member of the Wurstfest Association, and was recently named a 2017 Rising Star of New Braunfels. For these reasons and many more, Jewell is the sixth and final recipient of the Chair of the Board Award of 2017. Henry Ford received the award in the field of race relations in February, the Sophienburg’s Myra Lee Goff was honored in the field of heritage preservation in April, local businesswoman Becky Wiggins received the award in the field of philanthropy in May, Jo Ann West of Fiesta Lanes was honored in the field of youth development in August, and local businessman Pat Wiggins received the award for economic development in September. Jewell and his wife Alice will be invited as a special guests to the Annual Chamber of Commerce Banquet on January 26, 2018 where he will be further honored.